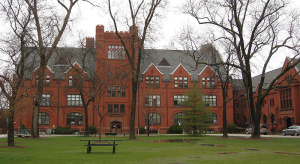 A system of public academic institutions with 13 four-year universities and 13 two-year colleges in various locations across the state of Wisconsin. The system's largest, most prestigious campuses are the research universities at Madison and at Milwaukee. "The Milwaukee-Downer "Quad" on the campus of UW-Milwaukee, April 25, 2009" by Freekee is licensed under Public Domain. 2015 Campuses. https://www.wisconsin.edu/campuses/, accessed March 16, 2015.